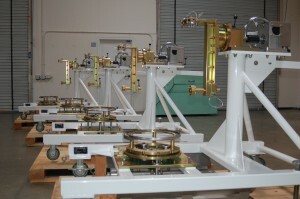 Carver Aerospace | Carver Engineering and Manufacturing, Inc.
Four T700MS1 Stands ready for crating. With over 30 years of experience in the design and development of Ground Support Equipment for the Department of Defense and its Contractors, Carver Aerospace – a Division of Carver Engineering and Manufacturing, Inc. – is highly qualified to provide our technical expertise and developmental insight into your Aerospace Support Equipment projects. We have designed, built and shipped dozens of the T700MS1 Engine Maintenance Stand (NSN: 4920015871479) to the US military and Foreign Military Services and are currently supporting Northrop Grumman – Aerospace Systems in an exciting DARPA project. We stand ready to assist you in any way, from conceptual design through production manufacturing, to fulfill your Aerospace GSE needs. Contact us today to discuss your project and how Carver Aerospace can ensure its success. Carver Engineering and Manufacturing, Inc.